I'm not typically a fan of Thomas Friedman - who has written wildley simplistic and poorly reasoned books like "The Lexus and the Olive Tree" and, even worse, "The World is Flat." In many ways I consider him part of the 90's era crowd that thought the digital age would make place/location irrelevant and that the internet would diminish the importance of central cities in the global economy. This was always more of a conservative political argument than anything based on an understanding of history, culture or business. In reality the importance of central cities has arguably increased dramatically over the last 20 years. The sprawling environment that most American's take for granted (or took for granted before 2008) will be more of a tangent to history rather than a change in its course. With demographic changes, the burden of student loans, the explosion of the housing bubble and rising gas prices, it makes increasing sense for people to live more moderately sized lives in more urban environments, especially if the city can meet the same basic conveniences and expectations of the suburbs (schools, recreation, etc). I appreciate this article because it calls attention to a larger dilemma that Rahm Emanuel and the City of Chicago currently face. 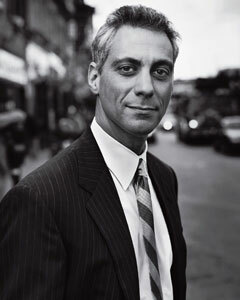 Despite the characterizations of his opponents, Rahm Emanuel, like President Obama, is not part of the old Chicago Democratic Machine. He, like Obama, is a 21st Century Pragmatist. Emanuel ran on an honest platform that the City was going to have to make some "tough decisions" and I largely applaud his efforts so far. It's easy to blame local politicians for all of the problems that you see in your community - the decline of the middle class especially. Old-school Chicagoan's have been pointing fingers at Daley (and now Emanuel) for pandering too much to the Global Elite. Daley invested heavily in the beautification of downtown while arguable neglecting many struggling neighborhoods on the South and West Sides. The most recent battle in our City's little political civil war is over the NATO/G8 summits this May (This will surely be a recurring topic of this blog). While I don't agree with everything that President Obama, or Rahm Emanuel have done (I'm not sure where I stand on the NATO/G8 issue for example), I do understand their motivation. The reality of our City and our Nation in the 21st Century is far different and, in many ways, more complex than it was 60 years ago. We are forced, by our economic system, to compete - as individuals and as people. This, of course, facilitates any number of wondrous things, but it's also, in many ways, a race to the bottom for most of us. We live in a winner-take-all society. These days you're either "winning" or "losing." All other subtleties of life are devalued. We and our Cities have been commoditized. Chicago occupies an endlessly fascinating position within our cultural/economic system precisely because it isn't easy to commoditize. People don't quite buy into it in the same way the buy into the idea of N.Y. or L.A. for example. It is not a political capital like London, Paris, Washington D.C., Moscow or Beijing. It is not an unquestioned cultural capital like New York, L.A. or again London and Paris. It's not even a lifestyle capital like the cities of the Pacific Northwest or Denver. Chicago isn't new and cheap like Atlanta or Dallas. Our city is a balance of everything. It is the most diverse economy in the country and by many measures the 4th most important business center in the world (after N.Y.C., London and Tokyo). In many ways it is a cultural "feeder" for New York and L.A. Countless actors, comedians and artists start their careers in Chicago, but there's also a sense that there's only so far you can go before moving to the coastal capitals. In many ways this dynamic gives our city its unique character and honestly. Chicago has few pretensions compared to its rivals. There are no "Real Housewives" of Chicago (I know they exist, but thank god they haven't made us look as shallow and superficial as Orange County or Atlanta). In my mind Chicago is one of the only sane places in this country, but of course that's subjective. For now Chicago doesn't have a lock on any one industry or product. This is both a blessing and a curse. It means that we haven't suffered the fate of Detroit, but we also can't be as secure as New York. Chicago has to continue to re-invent itself. It has to fight to stay relevant.